This DTG Viper has been completely reconditioned and comes with training, lifetime support and warranty. 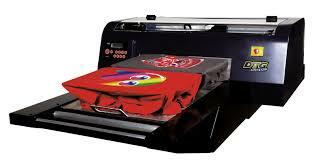 The DTG Viper has a 16” wide print area, and with the all-new platen system, can print images up to 45" long. Designed to meet the needs of all embroiderers, screen printers, color studios, kiosk operators and garment decorators worldwide, a new and reliable digital direct to garment printer from DTG. The DTG brand is well-known globally as a true innovator in the garment decorating industry and the new DTG Viper is the culmination of four years of ongoing research and development. With an all-new one-inch ink repelling coated piezo print head, and a constant pressurized ink delivery system, superior reliability and long-term durability are now standard features on the DTG Viper. DTG's exclusive WIMS II White Ink Management System is now included on all DTG models. WIMS constantly circulates and filters the white ink, practically eliminating white ink separation and clogging issues, resulting in better prints on dark garments and drastically reduced maintenance time. Bulk Ink System - 8 (4 oz.) easily refillable, wide mouth bottles. Includes a 4-in-1 configurable platen - configure as 1 extra-large platen, 2 adult platens, or 4 youth platens. Serviceability - Award winning service department that backs the products with knowledge and knowhow. Parts availability - We carry a large inventory of parts to give our customers added peace of mind. Again, we back what we sell! Warranty - One year limited warranty covering parts and labor. Yes, We still have some. What's the selling price again? Are you able to ship?